http://www.line-stickers.com/ – natchan Line Sticker | Suntory’s natchan is here to play! Your friends will love her expressions: cute, happy & sometimes sad. Enjoy your chats with natchan! Available till 10/9/2012. 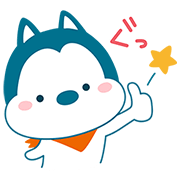 Name (LINE Sticker) : natchan! Bac Bac’s Diary is Moving!